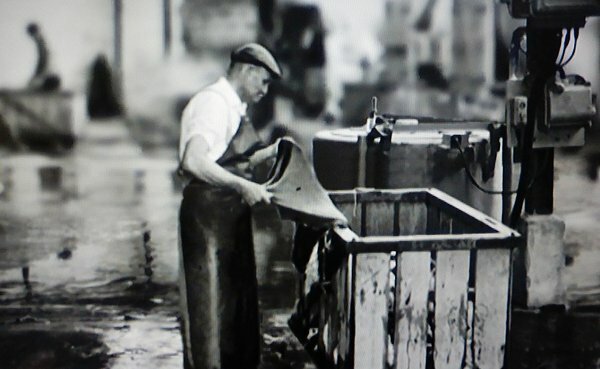 His father had been involved with the tanning of skins in the Northampton area and, moving to Yeovil in 1952 Lionel Nichols, together with his brother Alan, established a company of leather dressers and glove manufacturers that was to grow into a small associated group of companies; LH Nichols Ltd, Jones & Turner Ltd and Stirling Leather Ltd. 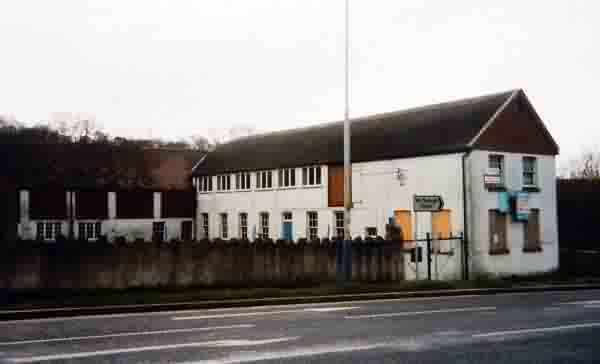 The original main production premises were off Hendford / Brunswick Street, close to the present police station roundabout, and part of the original buildings are now Coopers Mill but production moved firstly to Milborne Port then returned to Yeovil, setting up in the Nautilus Works off Reckleford around 1990. The company LH Nichols Ltd was described as specialists in 'Slink Lambskins' which it initially imported from South America and later from New Zealand. LH Nichols Ltd handled the marketing of the group's products. 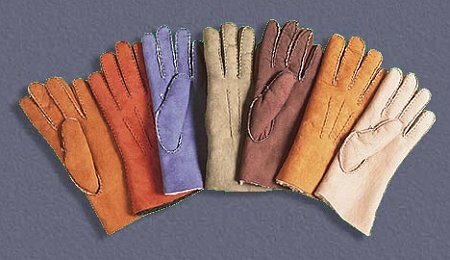 The gloving side of the business, a direct result of a surplus of skins in the early days, was carried out by Jones & Turner Ltd, founded for the purpose of manufacturing hand-sewn lambskin gloves and mitts. 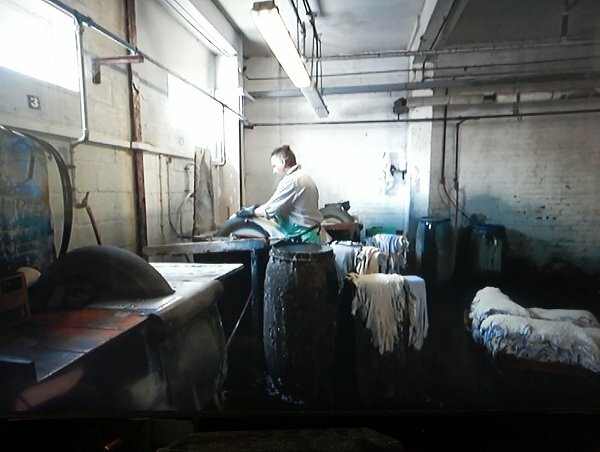 Stirling Leather was the tannery and leather dressing part of the organisation. This small group was able to make some headway in a declining market by establishing a niche and gradually building up trade, especially exporting across Europe. The Nichols' website offers the following - "Our skins are selected from lambs that die naturally at or soon after birth. 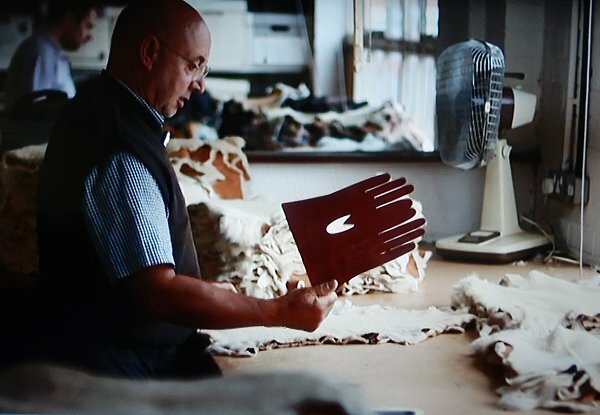 When they arrive at Nichols’ Somerset factory, they are soaked and washed to remove any impurities before cleaning and tanning which gives the slinks both incredible strength and wonderful softness. The skins are then 'wheeled' which produces their distinctive velvety suede feel and then treated with natural oils to build in suppleness. Then each skin is assured for weight, size and wool character before dyeing. Finally, the skins undergo further softening processes and a rigorous quality check before being packed and ready for dispatch." After a few years the opportunity arose for Nichols Ltd to purchase the New Zealand company that was supplying the raw skins; this became Nichols (New Zealand) Ltd. 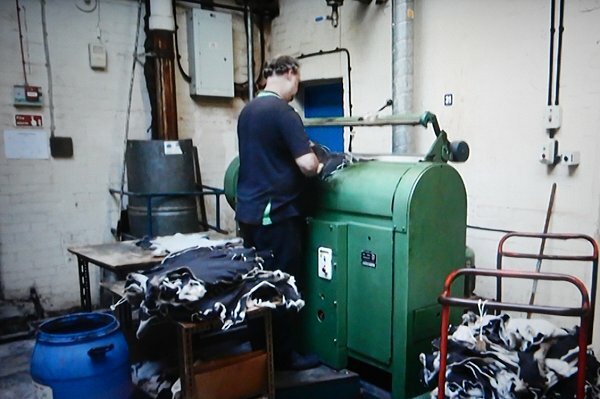 In 2013, with the end of the lease on the Yeovil factory and the retirement of key staff, production transferred to New Zealand trading as Nichols (New Zealand) Ltd. 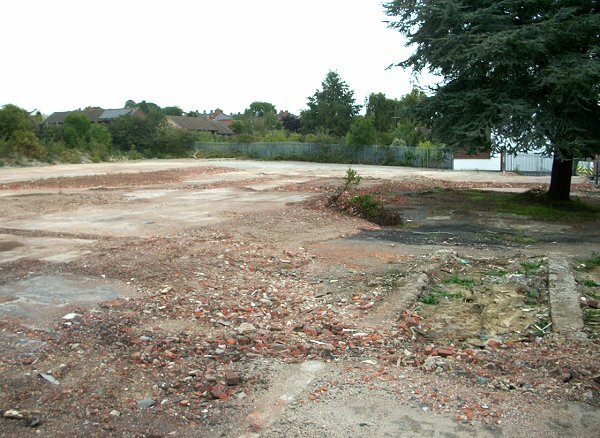 The Nichols factory in Reckleford, photographed below, was demolished and the site cleared during the summer of 2015. Brunswick Street seen from Hendford and photographed in the 1960s. 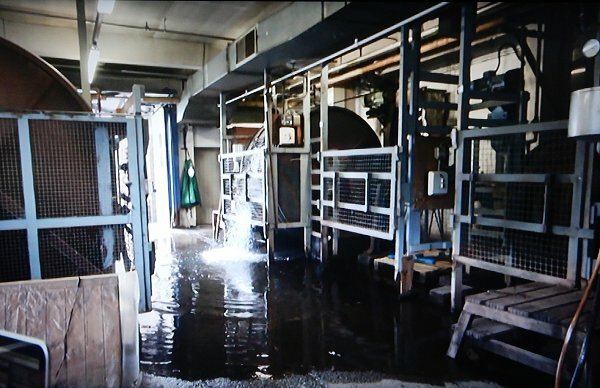 At right is Nichols' Tannery, specialising in processing lambskins and suede. The Nichols' tannery seen from Brunswick Street, probably in the late 1950s. 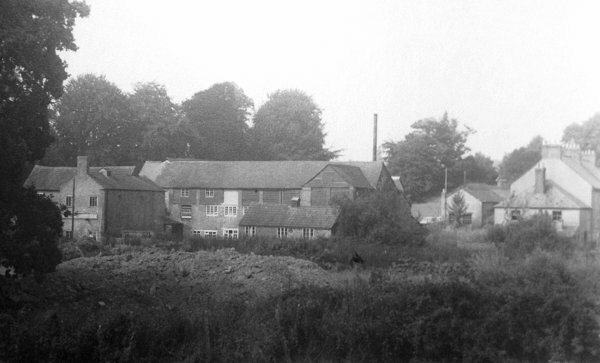 The Nichols' tannery seen from Dodham Brook, probably in the early 1960s. Hendford and Brunswick Street photographed around 1975. 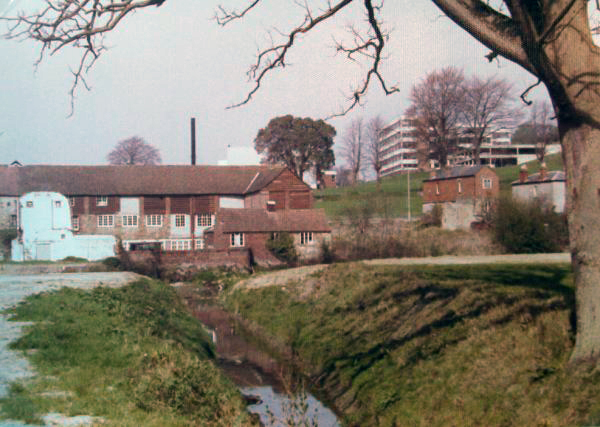 At right is the Nichols' leather dressing factory, later the Hendford and today called Cooper's Mill. 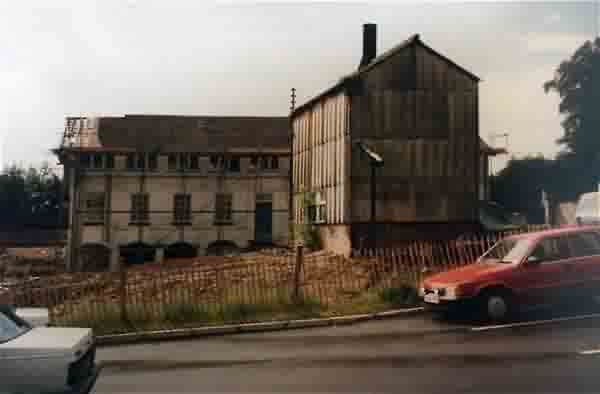 The Nichols' factory, closed and for sale in 1986. Photographed from Brunswick Street. I'm not sure when this was taken - or, indeed, where from. I'm guessing around the time it was converted to 'The Hendford' pub in which case it would be around 1988 or '89. 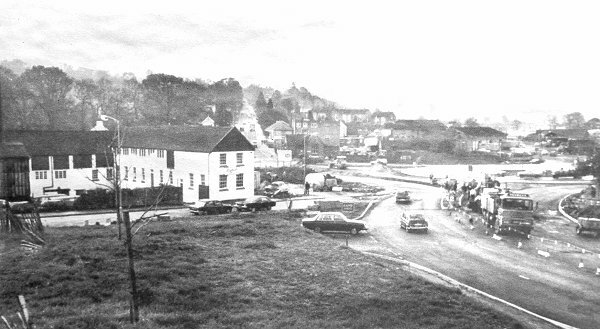 The southern end of Hendford being modified in 1977 when the new police station roundabout was being built. 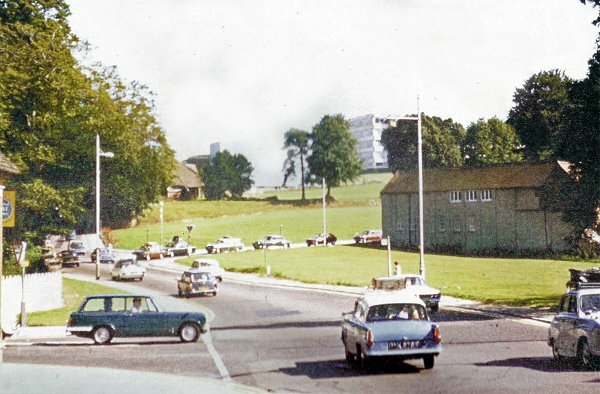 The large white building at left is Nichols' lambskin dressing factory, later converted to Coopers Mill. 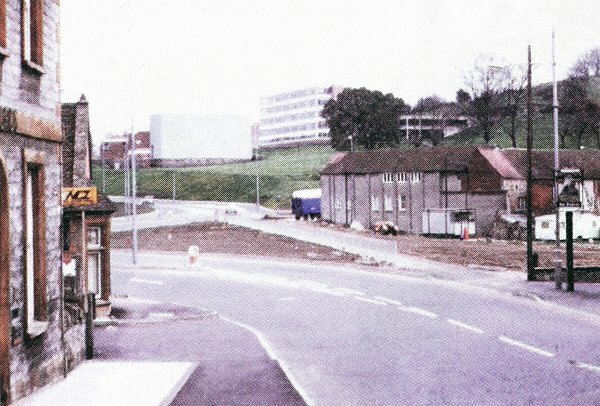 The new road layout nears completion in this photograph of later 1977, seen from the bottom of Hendford Hill with the Nichols' factory at right. 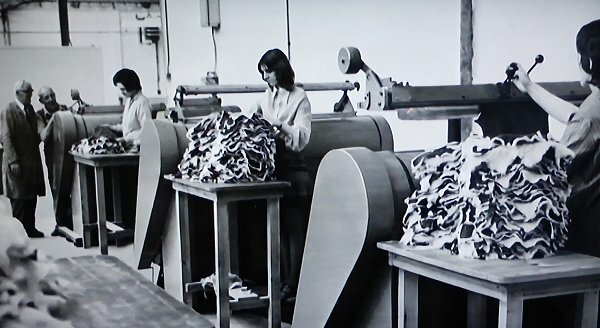 Skins going through an early process in production at the old Brunswick Street site. A later stage in production, again at the Brunswick Street site. 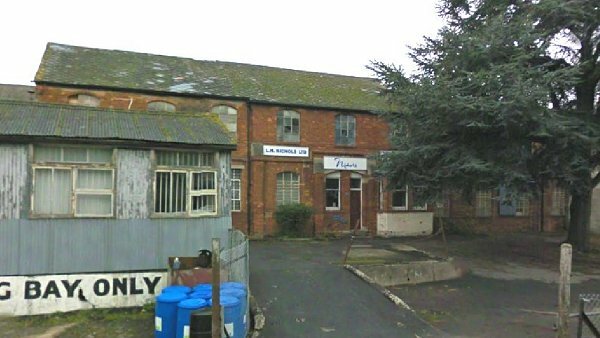 LH Nichols Ltd moved production to these premises at the Nautilus Works, Reckleford. This is at the rear of the main Nautilus Works used by the bus company. The demolition of the former LH Nichols factory. Photographed July 2015. 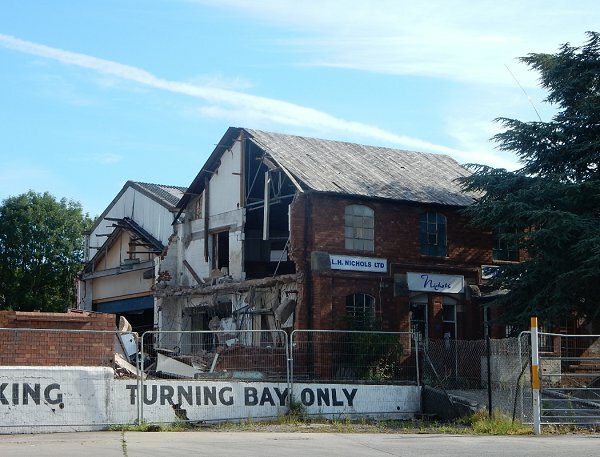 The site of the former factory in November 2015 - for sale with a guide price of £950,000. Just before LH Nichols Ltd moved from Yeovil in 1913 they produced a video showing how slink lambskin was produced at their factory in the Nautilus Works. I am most grateful to Malcolm Nichols for giving me a copy of the video and allowing me to include the stills below. 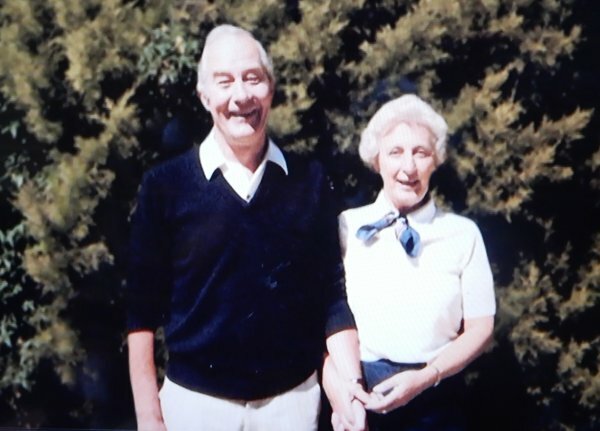 Lionel Nichols, founder of LH Nichols Ltd, with his wife. When they arrived from New Zealand the skins were salted, so the first operation was to remove the salt. Acid was then added to preserve the skin and also to break down the fat cells over a period of two to three weeks, after which they would be stored. After storage the skins were 'degreased' which removed all the excess fat in the skin. After this the skin was 'fleshed' on a fleshing machine to remove any remaining surplus fat. The skins would then be washed and excess water removed. The skins would then be tanned. 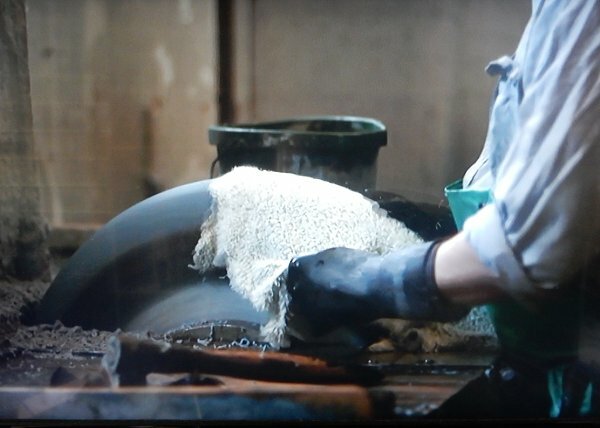 After tanning the skins would then be passed over a carborundum wheel to create the suede of the finished product. A close-up detail of a skin on a carborundum wheel. 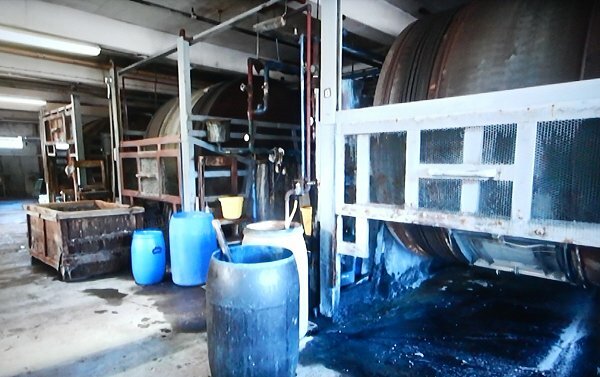 After the carborundum wheeling the skins would be placed in another large drum to have the fat liquor put back in to lubricate and soften them before drying. 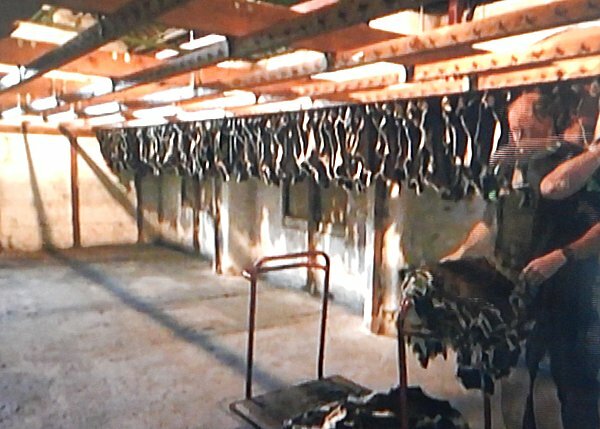 After these processes the skins were hung up to dry. Traditionally dried in the upper roof space where the walls were frequently timber louvres (see the photos of Bide's leather works before the top storey was removed) and the floorboards spaced out so that air could circulate. After drying they would be softened on a staking machine. The skins would then be graded and sized. The cut-out is a glove 'trank' used to estimate skin sizes. If the trank fits once on a skin, that skin would make one glove but if it fitted twice, the 'two trank' skin would make a pair of gloves. One of the last processes was to dye the skins, after which they would be dried, staked again and softened further. The skins would then be passed over another carborundum wheel to bring the suede up.